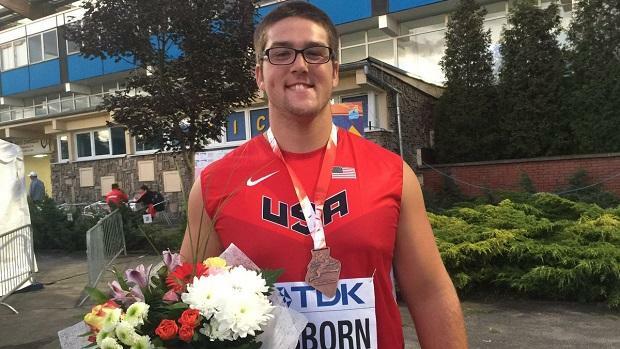 On the first day of competition at the U20 World Championships in Bydgoszcz, Poland, Esperanza star Bronson Osborn produced the biggest highlight for Team USA. The rising senior earned the bronze medal at the meet formerly known as "World Juniors," throwing the 6 kg shot put 21.27 meters (69' 9.5"). According to Track & Field News, the authority on all-time high school records, that is the best throw in US high school history! The 6 kg shot put is the equivalent of 13.2 pounds, which makes it heavier than the standard shot put (12 pounds) that is used in US high school competition. Osborn wasn't the only California athlete to start the meet on a good note; in fact, Golden State athletes went 3-for-3 in making the finals on day 1! Elena Bruckner threw 53.83 meters (176' 7.25") on her first attempt in the discus qualifying round, allowing her to pass her remaining two throws and still advance to the final with the 2nd-best mark. Rachel Baxter also advanced, joining 9 other athletes that cleared 4.15 meters (13' 7.5") - the top two athletes entered at 4.20 (13' 9.25") and cleared that height to claim the top spots in the final.